At the recent MIT Enterprise Forum, we heard about an open source mobile healthcare platform being used in developing countries, a personal healthcare system that includes mobile and social networking components, and a tubing-free, wirelessly connected, watertight personal/wearable insulin pump. Healthcare and mobile are two areas ripe with innovations and investments. We wanted to share some interesting and inspiring examples we heard about the convergence of these two domains, starting with one example that raises hopes for improving the standard of healthcare amongst the world’s poorer citizens. Formerly known as Moca, Sana is a volunteer organization of students and alumni from MIT, Harvard’s School of Public Health, Harvard Business School, and other respected institutes. They have built a highly customizable/ adaptable, open-source, end-to-end telehealth system for connecting healthcare workers with medical professionals. 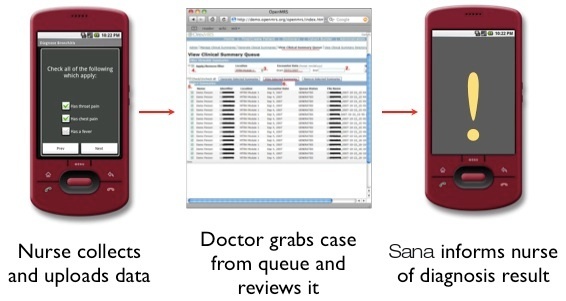 Sana also assists with process redesign to optimize healthcare delivery in developing countries. The mobile software runs on Android-based phones, allowing the nurse or doctor in the field to remotely examine, enter data, and take pictures of the patient. The types of data they can enter and send depend on the diagnostic equipment available in the field. The system can transmit written information, photos, video or audio recordings, x-rays, ECG, and ultrasounds from the field to expert doctors. At the MIT event, Dr. Leo Anthony Celi (MD, MPH, MS), a co-founder of Sana, spoke about their work and the technology they’ve built. In the developing world, patients often make excruciatingly long journeys to clinics, only to be referred to an expensive service they can’t afford in another location. Hence the appeal of bringing healthcare out to the patients in an affordable way. Besides the lack of healthcare resources in developing countries, there is absence of documentation of care, lack of process standardization and outcome tracking, high variability in the quality and methods of care, and no system for driving quality improvements. Sana is attempting to tackle these challenges. 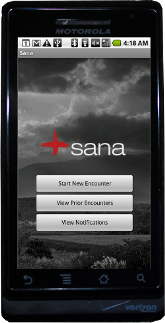 The World Health Organization (WHO) is partnering with Sana and the mHealth Alliance to formulate best practices and measure compliance by the frontline healthcare workers. 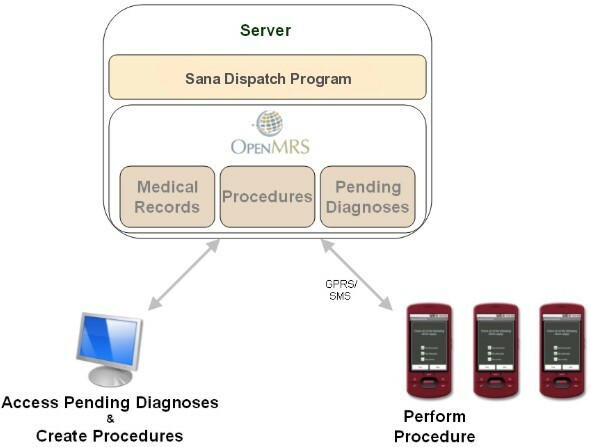 Decision tree algorithms in the Sana system guide community healthcare workers in evaluating and treating patients, as well as streamlining the triage process. In fact, standardization of procedures is a central goal of Sana. They accomplish this by establishing step-by-step workflows that appear on the mobile device as a set of forms with questions and instructions. The healthcare worker might be asked to take a picture, ask the patient a set of questions, record some audio, or take a reading with one of their instruments such as ECG reading. 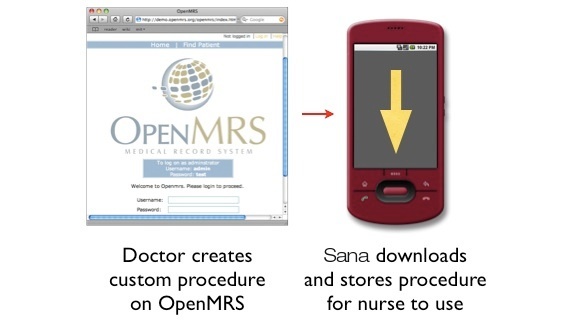 Sana leverages standards such as OpenMRS (Open Medical Records System), which can be used to create custom procedures for a patient among other things. The information in Sana’s database can be used by decision-support systems and for machine learning. An interesting question that came up during Q&A was whether the data across many patients in a country or region could be analyzed by a central health authority to identify disease outbreaks. Dr. Celi said that while they encourage sharing of algorithms and customizations, the actual patient data is not shared across organizations, but rather is private to each healthcare organization. (I assume privacy issues come into play here.) It was not clear whether or not a national or international organization would be precluded from using the system for disease control purposes, if they could get access to that data. In India, they are doing screening of cancer and chronic disease (e.g. taking pictures for screening oral cancer), as well as early detection of heart disease and diabetes. For cardiovascular risk assessment they followed the Lancet protocol (BMI, blood pressure, etc.). Sana has conducted workshops in Bangalore and Delhi, where they have partnered with the IIITD (Indraprastha Institute of Information Technology Delhi). In Brazil, Sana’s platform is used for screening for common eye conditions, such as cataract, trachoma, retinal disease, and error of refraction. They take photos of the anterior chamber of the eye. In the Philippines, where there is a serious shortage of doctors, Sana has engaged with healthcare workers and also conducted several developer workshops to build a cadre of developers there to help build out the platform. Dr. Celi stressed that technology alone is not enough. They need to bring together the silos within healthcare. Sana has recruited change management experts to join the cause. Government and public health experts identify local needs, healthcare providers help design and test the platform customizations, academics perform outcome studies and do value chain analysis. This has been gratifying work for all involved. And Sana has won various awards. The world needs more organizations and efforts like this. In Part Two of this article, we will discuss other innovations from the MIT mobile healthcare event. In Part Three of Mobile Healthcare Innovation we look at OmniPod, a tubing-free, wirelessly connected, wearable insulin pump.